Introduction. (K.T. Leicht). Education, Social Closure, and Social Mobility. Education, Employers, and Class Mobility. (M. Jackson, J.H. Goldthorpe, C. Mills). Recruitment into the Eastern European Communist Elite: Dual Career Paths. (E. Hanley, D.J. Treiman). Participation in Work-Related Education: Variations in Skill Enhancement Among Workers, Employers, and Occupational Closure. (D.B. Bills). Educational Assortative Mating in South Korea: Trends 1930-1998. (H. Park, J. Smits). 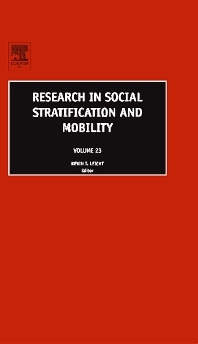 Class and the Educational Attainment of Siblings: An Explanatory Model of Social Mobility. (Yi-Lee Wong). New Insights on Ethnic Stratification in Israel. Ethnic Stratification and Place of Residence in Israel: A Truism Revisited. (I. Adler, N. Lewin-Epstein, Y. Shavit). On Ethnic Categories for Research in Israel: New Data on an Old Issue. (A. Khazzoom). Perceptions and Collective Responses to Inequality. Public Attitudes to Economic Policy in East and West: Efficiency, Subsidies, and Public Ownership. (J. Sikora). Perceived Image and Utility of Collective Action Organizations Among U.S. Physicians. (T.J. Hoff). Productivity, Technology, and Economic Inequality. Relative Deprivation, Efficiency Wages, and Labor Productivity in Taiwanese Manufacturing Industries. (J. Liu, A. Sakamoto). Minimum Wages and Income Inequality in the American States, 1960-2000. (T.W. Volscho Jr.). Wiring the World: Access to Information Technology and Development in Poor Countries. (Y.W. Bradshaw, K.M. Fallon, J. Viterna).